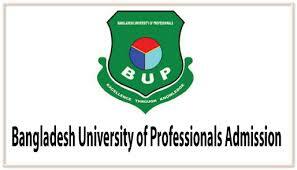 Bangladesh University of Professionals(BUP) Admission Circular 2016-2017 has been published today. BUP invites application from eligible candidates for admission four years honors and two years masters program. Students who’ve passed HSC or equivalent examination in 2015 and 2016 only are allowed to apply for BA/BSS/BSc Degree Programs. Students of Science Group must have earned GPA 4.75 in SSC or equivalent and GPA 4.50 in HSC or equivalent exam. Students of English Medium, North American and International Baccalaureate (IB) Curricula must have qualified in 05 (five) subjects with minimum „B‟ grade or GPA 3.00 or 70% marks respectively in an average in GCE O–Level and minimum „B‟ grade or GPA 3.00 or 70% marks respectively in 02 (two) subjects in GCE A–Level. Candidates must not have any „F‟ grade in any subject of both levels. A candidate must pass SSC and HSC examination or its equivalent in any discipline. (2) Students of Science Group must have earned GPA 4.75 in SSC or equivalent and GPA 4.50 in HSC or equivalent exam. Students must have earned GPA 5.00 in SSC and equivalent and GPA 4.75 in HSC or equivalent exam. Apply online through www.bup.edu.bdwebsite before 02 October 2016. Application process has been started from 19 August 2016. Admit Cards can be viewed and printed by individual applicants from www.bup.edu.bd on 06 October 2016 onwards. Date of Admission Test for Faculty of Arts and Social Scienceon 14 October 2016 (Friday) and Date of Publication of Result in BUP Website is on 18 October 2016. Date of Admission Test forFaculty of Arts and Social Science on 15 October 2016 (Saturday) and Date of Publication of Result in BUP Website is on 19 October 2016. Date of Admission Test for Faculty of Business Studies is on 21 October 2016 (Friday) and Date of Publication of Result in BUP Website is on 25 October 2016. Date of Admission Test for Faculty of Business Studieson 22 October 2016 (Friday) and Date of Publication of Result in BUP Website is on 26 October 2016. The Viva–voce will be held from 01 November 2016 to 22 November 2016. And the selected candidates list for admission in BUP will be published on website www.bup.edu.bd on 28 November 2016. Admission will starts from the list of selected candidates from 29 November to 08 December 2016 and09 December to 22 December 2016 from the waiting list. How to Apply for Admission in BUP? Application Processing Fee is Taka 300.00 (three hundred only) for each program. Application processing fee must be deposited online through your preferred Card/Mobile Financial Services/Internet Banking where service charge is applicable. Detailed Payment procedure is available at “How to Apply”. The date of Opening Convocation for new students on 02 January 2017 and Classes will starts on 03 January 2017.